This article is about the American cable channel. For Nickelodeon channels in other countries, see Nickelodeon (international). For other uses, see Nickelodeon (disambiguation). "Pinwheel (TV channel)" redirects here. For other uses, see Pinwheel. Nickelodeon (often shortened to Nick) is an American basic cable and satellite television network launched on December 1, 1977, and is owned by Viacom through Viacom Media Networks and based in New York City. It is primarily aimed at children and adolescents aged 9–16, while its weekday morning edutainment programs are targeted at younger children ages 2–8. As of February 2015, Nickelodeon is available to approximately 94.7 million pay television households (81.4% of households with at least one television set) in the United States. Nickelodeon's history dates back to December 1, 1977, when Warner Cable Communications launched the first two-way interactive cable system, QUBE, in Columbus, Ohio. Its C-3 cable channel carried Pinwheel daily from 7:00 a.m. to 9:00 p.m. Eastern Time. Nickelodeon launched on April 1, 1979, initially distributed to Warner Cable systems via satellite on the RCA Satcom-1 transponder. Originally commercial-free, advertising was introduced in January 1984. Nickelodeon's schedule currently consists largely of original series aimed at kids, pre-teens and young teenagers, including animated series (such as SpongeBob SquarePants, The Fairly OddParents, Miraculous: Tales of Ladybug & Cat Noir, ALVINNN!!! and the Chipmunks, Teenage Mutant Ninja Turtles, Harvey Beaks, Regal Academy, The Loud House, and Kuu Kuu Harajuku), to live-action comedy and action series (such as Nicky, Ricky, Dicky & Dawn, Power Rangers: Dino Charge, The Thundermans, Henry Danger, Legendary Dudas, Game Shakers, School of Rock, along with the month-long running show Make It Pop), as well as series aimed at preschoolers (such as Team Umizoomi, PAW Patrol, Bubble Guppies, Blaze and the Monster Machines, Wallykazam! and Dora and Friends). The channel also airs reruns of select original series that are no longer in production (such as iCarly and Bella and the Bulldogs), as well as occasional original made-for-TV movies. The channel also aired bi-monthly special editions of Nick News, a newsmagazine series aimed at children that debuted in 1992 as a weekly series which ended in 2015. Nicktoons is the branding for Nickelodeon's original animated television series (although it has seldom been used by the network itself since the 2002 launch of the spin-off digital cable and satellite channel of the same name). Until 1991, the animated series that aired on Nickelodeon were largely imported from foreign countries, and some original animated specials were also featured on the channel up to that point. Original animated series continue to make up a substantial portion of Nickelodeon's lineup, with roughly 6 to 7 hours of these programs airing on the weekday schedule and around nine hours on weekends, including a five-hour weekend morning animation block. Since the late 2000s, after the channel struck a deal with DreamWorks Animation in 2006 to develop the studio's animated films into weekly series, the network has also begun to incorporate Nicktoons that utilize three-dimensional computer animation (such as The Penguins of Madagascar, Fanboy & Chum Chum and Winx Club) in addition to those that are produced through traditional or digital ink and paint. Nickelodeon does not air movies on a regular basis; however, it does produce its own original made-for-cable television movies, which usually premiere in weekend evening timeslots or on school holidays. The channel occasionally airs feature films produced by the network's Nickelodeon Movies film production division (whose films are distributed by sister company Paramount Pictures). Although the film division bears the Nickelodeon brand name, the cable channel does not have access to most of the movies produced by its film unit. Nickelodeon does have broadcast rights to most feature films based on or that served as the basis for original series produced by the channel (such as Barnyard: The Original Party Animals and The SpongeBob SquarePants Movie); the majority of the live-action feature films produced under the Nickelodeon Movies banner are licensed for broadcast by various broadcast and cable television outlets within the United States other than Nickelodeon (although the network has aired a few live-action Nickelodeon Movies releases such as Angus, Thongs and Perfect Snogging and Good Burger). Nickelodeon also advertises hour-long episodes of its original series as movies; though the "TV movie" versions of Nickelodeon's original series differ from traditional television films in that they have shorter running times (approximately 45 minutes, as opposed to 75–100 minute run times that most television movies have), and use a traditional multi-camera setup for regular episodes (unless the program is natively shot in the single-camera setup common of films) with some on-location filming. Nickelodeon also periodically acquires theatrically released feature films for broadcast on the channel including Universal's Barbie: A Fashion Fairytale, several Monster High films, and Teenage Mutant Ninja Turtles: Turtles Forever (which was later released by Nickelodeon Movies through Paramount DVD for DVD release), with the Barbie and Monster High films usually aired under a brokered format in which Mattel purchases the time in order to promote the release of their films on DVD within a few days of the Nickelodeon premiere, an arrangement possible as Nickelodeon does not have to meet the Federal Communications Commission rules which disallow that arrangement for broadcast channels due to regulations disallowing paid programming to children. Nick Jr. – Nickelodeon currently programs shows targeted at preschool-age children on Monday through Fridays from 8:30 a.m. to 2:00 p.m. Eastern and Pacific Time (7:00 to 10:00 a.m. during the summer months, other designated school break periods and on major holidays). The block primarily targets audiences of preschool age as Nickelodeon's usual audience of school-age children are in school during the block's designated time period. Programs currently seen in this block include Blaze and the Monster Machines, Team Umizoomi, Bubble Guppies, PAW Patrol, Max & Ruby, and Mutt & Stuff. Nick's New Saturday Night – "Gotta See Saturdays" is the collective branding of two blocks airing on Saturdays: a morning block of primarily animated series from 9:00 a.m. to 1:30 p.m. and a primetime live-action block airing from 8:00 to 10:00 p.m. Eastern and Pacific Time. Nickelodeon has long aired first-run episodes of its original programming on Saturdays, though this particular block debuted on September 22, 2012; recent episodes of certain original series may air when no new episodes are scheduled to air that week. The Saturday morning schedule features series such as SpongeBob SquarePants, Teenage Mutant Ninja Turtles, and Power Rangers Dino Charge, while the Saturday primetime schedule features The Thundermans and Henry Danger (all first-run episodes are cycled on the schedule, giving it a variable schedule). Premieres of the network's original made-for-cable movies also occasionally air during the primetime block, usually in the form of premiere showings. The historical SNICK logo used until its discontinuation in 2004. SNICK – "SNICK" (short for "Saturday Night Nickelodeon") was the network's first dedicated Saturday primetime block that aired from 8:00 to 10:00 p.m. Eastern and Pacific Time. Geared toward pre-teens and teenagers, it debuted on August 15, 1992 (with the initial lineup featuring two established series that originally aired on Sundays, Clarissa Explains It All and The Ren and Stimpy Show, and two new series, Roundhouse and Are You Afraid of the Dark?). The block featured mainly live-action series (primarily comedies), although it periodically featured animated series. SNICK was discontinued on August 28, 2004, and was replaced the following week (September 4, 2004) by a Saturday night edition of the TEENick block. 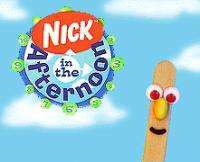 The historical Nick in the Afternoon logo used until its discontinuation in 1999. U-Pick Live – "U-Pick Live" (originally branded as "U-Pick Friday" from 1999 to late 2000, and originally hosted by the Henry and June characters from KaBlam!) was a block that aired weekday afternoons from 5:00 to 7:00 p.m. Eastern and Pacific Time from October 14, 2002 to May 27, 2005, which was broadcast from studios in New York City's Times Square district, where Nickelodeon is headquartered. Utilizing a similar concept that originated in 1994 with the Nick in the Afternoon block, "U-Pick Live" allowed viewer interaction in selecting the programs (usually cartoons) that would air on the block via voting on the network's website. The concept of user-chosen programming was later utilized part of a Friday edition of TeenNick's "The '90s Are All That" block that ran in 2011. The historical TEENick logo used until its discontinuation in 2009. TEENick – "TEENick" was a teen-oriented block that ran from March 6, 2001 to February 2, 2009, which ran on Sundays from 6:00 to 9:00 p.m. Eastern and Pacific Time; a secondary block on Saturdays launched in 2004, taking over the 8:00 to 10:00 p.m. Eastern and Pacific Time slot long held by SNICK. It was originally hosted by Nick Cannon, and then by Jason Everhart (aka "J. Boogie"). From January 16 to May 12, 2007, and again from March 1, 2008 to August 3, 2009, sister network The N ran a spin-off block "TEENick on The N". The TEENick name, which was dropped on February 2, 2009 (with the Saturday block remaining unbranded until the introduction of "Gotta See Saturdays" in 2013), later became the name of the rebranded The N on September 28, 2009. Nick Studio 10 – "Nick Studio 10" was a short-lived late afternoon programming block that ran from February 18, 2013 until June 17, 2013, which ran weekdays from 4:00 to 6:00 p.m. Eastern and Pacific Time. The block featured wraparound segments around episodes of the network's animated series, which were shown in an off-the-clock schedule due to the segments that aired following each program's individual acts. Nickelodeon Kids' Choice Awards – The Kids' Choice Awards are a 90-minute-long annual live awards show held on the last Saturday night in March (formerly the first Saturday in April until 2008). The award show (whose winners are selected by Nickelodeon viewers though voting on the channel's website and through text messaging) honors popular television series and movies, actors, athletes and music acts, with winners receiving a hollow orange blimp figurine (one of the logo outlines used for much of the network's "splat logo" era from 1984 to 2009). Nickelodeon Kids' Choice Sports Awards – A spin-off of the Kids' Choice Awards, "Kids Choice Sports" is held in July with the same KCA voting procedures and differing categories for team sports and athlete achievements for the previous year (featuring categories such as "Best Male Athlete", "Best Female Althete", "King Of Swag" and "Queen Of Swag"), along with the award featuring a sports-specific purple mohawk. Its inaugural ceremony aired on July 17, 2014 and originally suspended the international channels so people could only watch it on the main channel. Starting November 1 2016 Nickelodeon Advertised The Debut Of The Long Lost Kablam Episode 29 And It Would Air January 1st 2017. The historical Nick on CBS logo used until its discontinuation in 2006. Nick on CBS/Nick Jr. on CBS – On September 14, 2002, Nickelodeon began producing a two-hour Saturday morning block for CBS (which was co-owned with Nickelodeon at the time as a result of network parent Viacom's 1999 acquisition of CBS) featuring episodes of series such as As Told by Ginger, The Wild Thornberrys, Rugrats, Hey Arnold! and Pelswick debuted on most CBS stations. The block was retooled in 2005 as a preschool-oriented block featuring Nick Jr. shows (such as Blue's Clues, Dora the Explorer and Little Bill); "Nick Jr. on CBS" was replaced in September 2006 by the KOL Secret Slumber Party block (produced by DIC Entertainment, which was subsequently acquired by Cookie Jar Group), as a result of CBS and Viacom's split into separate companies. Nick at Nite (stylized as "nick@nite") is Nickelodeon's nighttime programming service, which debuted on July 1, 1985, and broadcasts Sunday through Wednesdays and Fridays from 9:00 p.m. to 7:00 a.m., Thursdays from 8:00 p.m. to 7:00 a.m., and Saturdays from 10:00 p.m. to 7:00 a.m. Eastern and Pacific Time. Originally featuring classic sitcoms from the 1950s and 1960s such as The Donna Reed Show, Mr. Ed and The Adventures of Ozzie and Harriet, programming eventually shifted towards repeats of popular sitcoms from the 1980s to the 2000s such as Home Improvement, The Cosby Show and Roseanne. Nick at Nite has also occasionally incorporated original scripted and competition series, with some in recent years being produced through its parent network's Nickelodeon Productions unit. Programs airing on Nick at Nite as of 2016 include Full House, Friends, The Fresh Prince of Bel-Air and George Lopez, as well as original series such as See Dad Run and Instant Mom. ACNielsen rates Nick at Nite as being a separate cable channel from Nickelodeon. Nicktoons is a digital cable and satellite television network that launched on May 1, 2002 as Nicktoons TV; it was renamed as Nicktoons in May 2003, before rebranding Nicktoons Network from 2005 until reverting to its previous name in September 2009. The network airs a mix of newer live action & animated shows from Nick (like The Haunted Hathaways, Fanboy & Chum Chum, Robot and Monster, SpongeBob SquarePants and Teenage Mutant Ninja Turtles along with original series produced exclusively for Nicktoons). Nick Jr. is a digital cable and satellite television network aimed primarily at children between 2 and 7 years of age, featuring a mix of current and some former preschool-oriented programs from Nickelodeon, and original series exclusive to the channel; it originally launched on February 2, 1999 as Noggin, a joint venture between MTV Networks and the Children's Television Workshop (now Sesame Workshop), the latter of which sold its stake to Viacom in 2002. On September 28, 2009, the network was relaunched as Nick Jr., named after the former preschool program block of the same name that aired on Nickelodeon from January 1988 to February 2009. The network debuted Nickmom, a four-hour nightly program block aimed at mothers in September 2012, which was controversial at its start due to its more lenient content standards (including some profanity, crude humor and suggestive references) than what is otherwise permitted on Nick Jr., particularly as the network operates a singular Eastern Time Zone feed, which results in the Nickmom block airing at the same time in all six U.S. time zones (being broadcast as early as 5:00 p.m. in the Hawaii–Aleutian Time Zone). While traditional advertising appears on the channel during the Nickmom block, the network otherwise only runs programming promotions and underwriter-style sponsorships in lieu of regular commercials. TeenNick is a digital cable and satellite television network that is aimed at teenagers and young adults, which originated as a nighttime block called "The N" on Noggin (in a similar scheduling structure as Nickelodeon and Nick at Nite) on April 1, 2002 and was spun off into a standalone channel on December 31, 2007, when it took over the satellite transponder of Nickelodeon Games and Sports. On September 28, 2009, the network was rebranded as TeenNick, named after the former TEENick block that aired on Nickelodeon from July 2000 to February 2009. Although TeenNick has more relaxed program standards than the other Nickelodeon channels (save for Nick at Nite and the Nickmom block on Nick Jr.) – allowing for moderate profanity, suggestive dialogue and some violent content – the network has shifted its lineup almost exclusively towards current and former Nickelodeon series (including some that are burned off due to low ratings on the flagship channel) that have stricter content standards. It also airs some acquired sitcoms and drama series (such as Degrassi, which has aired on the network since 2003 as The N) and until the rebrand, also incorporated some original programming. On July 25, 2011, TeenNick began airing The '90s Are All That, renamed The Splat in October 2015, a block of Nickelodeon's most popular 1990s programming, targeting the network's target demographic from that era. NickMusic is a cable network in the United States mainly featuring music video and music-related programming from younger pop artists that appeal to Nickelodeon's target audience. It launched on the channel space formerly held by MTV Hits on September 9, 2016. TV Land is a basic cable and satellite channel that debuted on April 29, 1996. Based on the Nick at Nite block, it originally aired classic television series from the early 1950s to the 1970s, but beginning in 2004, has broadened its programming inventory to include series from the 1980s and 1990s (and more recently, the 2000s). In 2008, TV Land began producing its own original series: originally these were reality series; however, the network ventured into scripted originals with the 2010 debut of Hot in Cleveland. On December 17, 2006, Viacom's MTV Networks Kids & Family Group division took over operational responsibilities for TV Land from Nick at Nite (concurrent with Nickelodeon taking operational duties for Nick at Nite), though TV Land continues to be operated as part of the company's Viacom Media Networks unit. Nickelodeon Games and Sports for Kids (commonly branded as Nickelodeon GAS or Nick GAS), was a digital cable and satellite network that launched on March 1, 1999, as part of the suite of digital cable channels launched by MTV Networks. It ran a mix of game shows and other competition programs from Nickelodeon (essentially formatted as a children's version of—and Viacom's answer to—the Game Show Network). The channel formally ceased operations on December 31, 2007, with The N taking over its channel space as a separate 24-hour network; however, an automated loop of Nick GAS continued to be carried on Dish Network due to unknown factors until April 23, 2009. NickMom (stylized as nickmom) was a programming block launched on October 1, 2012, airing in the late night hours on Nick Jr. The block attempted original programming targeted towards young mothers until 2014, then began to carry acquired films and sitcoms, along with the 2010 version of the TV series Parenthood. Due to Viacom's 2015 cutbacks involving acquired programming and low ratings, the NickMom block and associated website was discontinued in the early morning hours of September 28, 2015. Nick 2 Nick 2 is the off-air brand for a secondary channel of Nickelodeon available on the digital tiers of cable providers, that is available in addition to the main Nickelodeon feed for the respective time zones on the provider's basic tier. Nick 2 is a repackaged version of Nickelodeon's Eastern and Pacific Time Zone feeds – the Pacific feed is distributed to the Eastern and Central Time Zones, and the Eastern feed is distributed to the Pacific and Mountain Time Zones – resulting in the difference in local airtimes for a particular program between two geographic locations being three hours at most, allowing viewers a second chance to watch a program after its initial airing on the Eastern Time Zone feed or to watch the show ahead of its airing on the Pacific Time Zone feed of the main channel (for example, the Nick at Nite block would respectively start at 11:00 p.m. Eastern on Nick 2 Pacific or 5:00 p.m. Pacific weeknights on Nick 2 Eastern). Currently, the Nick 2 feeds do not feature a high-definition simulcast channel. Nick Too was originally offered as part of the MTV Networks Digital Suite, a slate of channels exclusive to digital cable tiers (though most of these channels are now also carried on satellite), and is the only current example in which two feeds of a non-premium service are provided to cable and IPTV providers. A Nick TOO logo was used on the channel until 2004, when MTV Networks decided to stop using customized branding on the feed (a logo for Nick 2 is only used for identification purposes on electronic program guides as a placeholder image); most television listings thus either show the additional channel under the brandings "Nickelodeon Pacific/NICKP" or "Nickelodeon Eastern/NICKE". DirecTV and Dish Network also offer both Nickelodeon feeds, though they carry both time zone feeds of most of the children's networks that the providers offer by default. Nick on Demand Nick on Demand is the network's video-on-demand service, which is available on most cable and satellite providers. It carries Nickelodeon's live-action, animated and preschool programming; however, acquired programs seen on Nick at Nite are not included as the syndication rights to most of the programs seen during the block are limited by contract to air in nighttime slots on the linear television channel. Nick.com is Nickelodeon's main website, which launched in October 1995 as a component of America Online's Kids Only channel before eventually moving to the full World Wide Web. It provides content, as well as video clips and full episodes of Nickelodeon series available for streaming. The website's popularity grew to the point where in March 1999, Nick.com became the highest-rated website among children aged 6–14 years old. Nickelodeon used the website in conjunction with television programs which increased traffic. In 2001, Nickelodeon partnered with Networks Inc. to provide broadband video games for rent from Nick.com; the move was a further step in the multimedia direction that the developers wanted to take the website. Skagerlind indicated that over 50% of Nick.com's audience were using a high speed connection, which allowed them to expand the gaming and video streaming options on the website. Nickelodeon released a free mobile app for smartphones and tablet computers operating on the Apple and Android platforms in February 2013. Like Nick.com, a TV Everywhere login code provided by participating cable and satellite providers is required to view individual episodes of the network's series. Nickelodeon Magazine was a print magazine that was launched in 1993; the network had previously published a short-lived magazine effort in 1990. Nickelodeon Magazine incorporated informative non-fiction pieces, humor (including pranks and parodical pieces), interviews, recipes (such as green slime cake), and a comic book section in the center of each issue featuring original comics by leading underground cartoonists as well as strips about popular Nicktoons. The magazine ceased publication after 16 years in December 2009, citing a sluggish magazine industry. A new version of the magazine was launched by Papercutz in June 2015. Nick Radio is a radio network that launched on September 30, 2013, in a partnership between the network and iHeartMedia (then called Clear Channel Communications), which distributes the network mainly via its iHeartRadio web platform and mobile app; its programming is also streamed via the Nick.com website and on New York City radio station WHTZ as a secondary HD channel. Nick Radio focuses on Top 40 and pop music (geared towards the network's target audience of children and adolescents, with radio edits of some songs incorporated due to inappropriate content), along with celebrity interview features. In addition to regular on-air DJs, Nick Radio also occasionally features guest DJ stints by popular artists as well as stars from Nickelodeon's original series. Nickelodeon Universe at the Mall of America is the largest indoor theme park in the United States. On August 18, 2009, Nickelodeon and Southern Star Amusement announced that it would build a second Nickelodeon Universe in New Orleans, Louisiana by the end of 2010, which was set to be the first outdoor Nickelodeon Universe theme park. On November 9, 2009, Nickelodeon announced that it had ended the licensing agreement with Southern Star Amusements. Nickelodeon Studios as viewed from the Hard Rock Cafe in March 2004 before it moved. Nickelodeon Land opened on May 4, 2011 at Blackpool Pleasure Beach, featuring several rides based on Nickelodeon series including SpongeBob SquarePants, Avatar: The Last Airbender, Dora the Explorer and The Fairly OddParents. Nickelodeon Universe was also an area inside of Paramount's Kings Island featuring Nickelodeon-themed rides and attractions. The area was one of the largest sections in the park, and was voted "Best Kid's Area" by Amusement Today magazine from 2001 until the area's closure in 2009 after the park's sale to Cedar Fair. In March 2008, another version of Nickelodeon Universe opened at Mall of America with many characters from the network's series including SpongeBob SquarePants and Dora the Explorer. Nickelodeon Studios was an attraction at Universal Orlando Resort that opened on June 7, 1990, and housed production for many Nickelodeon programs (including Clarissa Explains It All, What Would You Do? and All That). The facility closed on April 30, 2005, after Nickelodeon's production facilities were moved to New York City and Burbank, California. The building that formerly housed Nickelodeon Studios is now occupied by the Blue Man Group Sharp Aquos Theatre. Another Nickelodeon themed attraction at Universal Studios Orlando, Jimmy Neutron's Nicktoon Blast, opened in 2003 but was closed in 2011 to make way for the new ride Despicable Me: Minion Mayhem, which was based on the 2010 film Despicable Me. In 2012, a store based on SpongeBob SquarePants opened in Woody Woodpecker's Kidzone, replacing Universal's Cartoon Store. Nickelodeon Central was an area inside of the Paramount Parks properties, including California's Great America, Carowinds, Kings Dominion, Canada's Wonderland and Dreamworld that featured shows, attractions and themes featuring Nickelodeon characters, all of which were wound down when CBS Corporation was given ownership of the theme parks in the Viacom/CBS split and eventually sold most of the properties to Cedar Fair without renewal of the Nickelodeon licensing agreements. The only Nickelodeon Central remaining in existence was at Dreamworld in Australia, which is not under Cedar Fair ownership. The licensed was revoked in 2011 and became "Kid's World" and later DreamWorks Experience. Nickelodeon Blast Zone was an area in Universal Studios Hollywood that featured attractions centered around Nickelodeon characters and themes. The four attractions that were present in the area were "Nickelodeon Splash", a waterpark-style area, "The Wild Thornberrys Adventure Temple," a jungle-themed foam ball play area, and "Nick Jr. Backyard," a medium-sized toddler playground. This area closed in the winter of 2007 and was rethemed as a Curious George ride. Another attraction, "Rugrats Magic Adventure", was present at the opening of the area in 2001, but closed in 2002 to make way for Shrek 4-D.
Nickelodeon Splat City was an area inside California's Great America (from 1995 to 2002), Kings Island (from 1995 to 2000) and Kings Dominion (from 1995 to 1999), that featured messy- and water-themed attractions. The slime refinery theme was carried out in the attractions such as the "Green Slime Zone Refinery", the "Crystal Slime Mining Maze" and the "Green Slime Transfer Truck". All of these areas were later transformed into either Nickelodeon Central or Nickelodeon Universe before being discontinued as mentioned above when sold off by CBS Corporation. Nickelodeon Animation Studio (formerly Games Animation) is a production firm located in Burbank, California, which serves as the animation facilities for many of the network's Nicktoons series. It also houses the headquarters of the Nicktoons cable channel. Nickelodeon Suites Resort was a Nickelodeon-themed hotel in Orlando, Florida, located near Universal Studios Resort and 1-mile (1.6 km) from Walt Disney World Resort. The property includes one, two, and three-bedroom Nick-themed kid suites and various forms of entertainment themed after Nickelodeon programs. Nickelodeon Suites Resort also contains a Nick at Nite suite for adults. The hotel closed entirely on June 1, 2016. Nickelodeon Resorts by Marriott was a proposed hotel chain similar to Nickelodeon Suites Resort, featuring a 110,000-square-foot (10,000 m2) waterpark area and 650 hotel rooms. Announced in 2007, the first location was scheduled to open in San Diego in 2010; however, plans to open that location were canceled in 2009. Plans for the remaining 19 hotels originally slated to open remain unclear. Nickelodeon Hotels, a hotel chain scheduled to open its first location in late 2016 in association with Karisma Hotels and Resorts. Nickelodeon at Sea is a series of Nickelodeon-themed cruise packages in partnership with Norwegian Cruise Line. These cruises feature special amenities and entertainment themed to various Nickelodeon properties. Norwegian Cruise Line also hosts some Nickelodeon Cruises on the Norwegian Jewel and Norwegian Epic liners, as part of Nickelodeon at Sea. Between 1993 and 1995, Nickelodeon opened international channels in the United Kingdom, Australia and Germany; by the later year, the network had provided its programming to broadcasters in 70 countries. Since the mid-1990s and early 2000s, Nickelodeon as a brand has expanded into include language- or culture-specific channels for various other territories in different parts of the world including Europe, Asia, Oceania and Canada, and has licensed some of its cartoons and other content, in English and local languages, to broadcast networks and cable channels such as KI.KA and Super RTL in Germany, RTÉ Two (English language) and TG4 (Irish language) in Ireland, YTV (in English) and Vrak.TV (in French) in Canada, Canal J in France, Alpha Kids in Greece and CNBC-e in Turkey. ↑ Seidman, Robert (February 22, 2015). "List of How Many Homes Each Cable Networks Is In - Cable Network Coverage Estimates As Of February 2015". TV by the Numbers. Zap2it. Retrieved February 28, 2015. 1 2 Hendershot 2004, pp. 15–16. ↑ "The Cable Center - Gustave Hauser". cablecenter.org. ↑ Pam Gelman. "Nick News with Linda Ellerbee - TV Show Rating For Kids and Families". Commonsensemedia.org. Retrieved June 2, 2010. ↑ Hendershot 2004, p. 87. ↑ Nickelodeon ventures into cartoons, Chicago Sun-Times (via HighBeam Research), August 10, 1991. ↑ "Nickelodeon and Dreamworks teaming up". Tvsquad.com. October 25, 2006. Retrieved June 2, 2010. ↑ Nick TV Schedule Nickelodeon/MTV Networks/Viacom International. ↑ Joe Lepper (July 26, 2004). "Nickelodeon tells kids to go out and play for anniversary". Media Week. Retrieved November 25, 2011. 1 2 Hendershot 2004, pp. 71–72. ↑ "Nick Jr.'s NickMom Primetime Comedy Block Sets Launch Date, Adds Docu Series". Retrieved August 29, 2012. ↑ Hoffman, Sybil (October 15, 2012). "Sexual comedy show airs on toddler network". KTVK, Phoenix. Retrieved October 16, 2012. ↑ Adalian, Josef (July 26, 2011). "Nick's New Nineties Nostalgia Block Is a Ratings Smash". New York. The Vulture. Retrieved October 9, 2011. ↑ "TV Land Opens up on MONDAY". April 23, 1996. Retrieved February 3, 2008. ↑ "Unlike your laundry pile, some things do come to an end. We're sad to say NickMom will be going off air & offline at the end of the month.". Tweet from network's Twitter account. September 9, 2015. Retrieved September 26, 2015. ↑ "Nick History". Nickelodeon. Archived from the original on January 27, 2005. Retrieved October 3, 2011. ↑ "Nickelodeon TV & Online Are Perfect Together as Nick.com Takes Top Ratings Spot in March". Entertainment Wire. May 19, 1999. Retrieved November 28, 2008. ↑ Brown, Karen (November 12, 2001). "Nick Looks to Gaming As High-Speed Revenue Play". MultiChannel News. Retrieved November 28, 2008. ↑ Deepak Dhingra. "Nickelodeon releases Nick app for iPad". Engadget. AOL. ↑ Hendershot 2004, pp. 55–56. ↑ "Nickelodeon Magazine Closing". June 4, 2009. Retrieved July 28, 2009. ↑ Larsen, Sven. "Nickelodeon and Papercutz Announce "First Look Deal"". Papercutz. Retrieved June 1, 2015. ↑ "Nickelodeon And Clear Channel Launch Nick Radio". Radio Ink. September 30, 2013. Retrieved October 1, 2013. ↑ "Clear Channel's iHeartRadio Unveils Nick Radio". MediaPost. September 30, 2013. Retrieved October 1, 2013. ↑ "Nickelodeon And CCM+E Launch First Ever Nick-Branded Radio Station On iHeartradio And Nick.Com". All Access Media Group. October 1, 2013. Retrieved October 1, 2013. ↑ White, Jaquetta (August 18, 2009). "Nickelodeon signs on to help turn around Six Flags amusement park, Nagin says". The Times-Picayune. Retrieved October 3, 2011. ↑ Jacquetta White (November 9, 2009). "Nickelodeon ends licensing agreement with Southern Star". Times-Picayune. New Orleans, LA. Retrieved June 2, 2010. ↑ "SpongeBob splashing into family vacations". money.cnn.com. CNN. May 31, 2007. Retrieved October 2, 2011. ↑ De Lollis, Barbara (May 25, 2010). "Marriott hotels to woo families this summer with help from Nickelodeon, SpongeBob and Dora". travel.usatoday.com. USA Today. Retrieved October 3, 2011. ↑ "Karisma Hotels & Resorts and Viacom International Media Networks Sign Landmark Agreement to Develop Nickelodeon Hotels - Business Wire". March 25, 2015. ↑ "Most Popular". USA Today. Retrieved May 20, 2010. ↑ "Family Cruises with Nickelodeon". Norwegian Cruise Line. Retrieved November 25, 2011. Hendershot, Heather (2004). Nickelodeon Nation: The History, Politics, and Economics of America's Only TV Channel for Kids. New York: New York University Press. ISBN 0814736521. Klickstein, Mathew (2013). SLIMED! An Oral History of Nickelodeon's Golden Age. New York: Plume. ISBN 0142196851.